Over the course of the Christian era, as the royal bloodlines and initiatory societies grounded in pagan antiquity were tamped down across Europe, a shift began to happen regarding both the goals of magic and the locus of the magical effect. Shamans, sorcerers and medicine men had originally emerged in a tribal context, and were invariably seen as servants and representatives of the people's conversation with the gods. 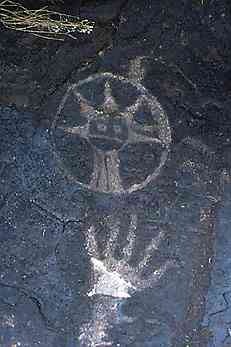 The shaman stood in for the other members of the tribe when it was time to make a request or solicit a judgment. As populations grew and became more settled, shamans formed into guilds and made alliances with other 'technicians of the sacred', such as metallurgists, herbalists, artists and musicians. These guilds fixed the boundaries of the shamanic role, although a wide range of individual expression was the norm due to the spontaneous nature of each one's calling and their resulting capacities. The lay public's fear of negative magical influence also served to put a brake on the free exploration of supernatural realms. In the Greco-Roman world, 'unsanctioned religious activity' became a catchall for prosecutable magic. It was confraternity with leaders and elders, including membership in sanctioned groups, that provided a context of guidance and safety for strongly self-directed individuals. After the Church became the binding authority in Europe, directing the efforts of inspired individuals into controlled channels became slightly easier. By this time the Church had delegated to itself the power to make kings as well as bishops. Nevertheless, Christianity did not find it possible to leave behind every aspect of earlier magical beliefs and usages. Those choirs of angels, archangels, principalities, powers, and the rest of the Middle Ages and Renaissance pantheon of divine operatives were in fact rehabilitated daemons from the Greco-Roman, Babylonian, Egyptian, Persian and Hebrew past. If we line up all these different streams of Mysteries in our minds, we can begin to see the common denominators that all of them shared and leaned upon. The core tradition grounding all these religions is astronomy, along with its related mythos and praxis. 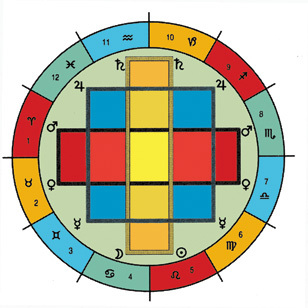 When the pantheons of the gods and goddesses are traced back to their core referents, we invariably find the seven planetary governors, the twelve signs and the four elements/directions setting the norms and providing the basis for their meanings. We have all, around the world, been watching the Moon, the Sun, and the five visible planets for as long as we can remember ourselves as humans, both for purposes of time-keeping, and for purposes of divination. The movement of the celestials has always been understood to reveal the 'footprints of the Gods', giving us signs to read that help us to understand events as they develop around us. Historically, the preoccupations of antique magic were mostly focused upon outside effects -- for example, success of crops; protection from enemies or diseases; love and vengeance charms. The world-view portrayed emphasizes the humbleness and helplessness of the individual petitioner who is begging for a favor. If the prayer or ritual is performed correctly, the petitioner seeks a boon to follow from the pleading and goodies put on offer. This kind of servile, bribing, bet-hedging behavior towards the Great Mystery is obvious not only in the magical practices of the ancient Hebrews, but around the world, being a sign of a certain stage in collective spirituality, which some societies hold onto for centuries longer than others do. From the spell-tablets and other remains of these practices worldwide, it's actually amazing to note how often the Divine is asked to accomplish some wish that, if satisfied, would break one or more of the Commandments! It's as if the Supernals were seen as crooked judges and jurors -- pliable with bribes and praises, but also capricious and arbitrary, demanding propitiation to guarantee good results. It should come as no surprise those operations done in such a craven, codependent and fear-based spirit have always been considered "black" or dangerous magic. This type of magic does harm to anybody involved in the process. The Renaissance magi wanted to use what had been bequeathed to them by history, but dedicated their efforts to a new goal and with new attitudes. Towards that end, they rehabilitated the ancient model of the solitary practitioner, who was so often envisioned within the malevolent Faust role, the demented witch cliché, or the inscrutably alien Asian so dehumanized by the clergy during the Crusades. The new wave of magi made a modification to the magus archetype, drawing from remembered echoes of the suppressed kingly and sacerdotal background of pagan European tradition, combined with the Holy Grail mythos and the Courtly Love tradition. 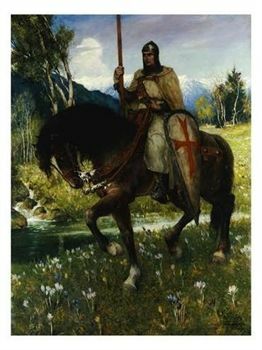 Now the requisite characteristic needed to identify oneself as a seeker, magus or Grail Knight becomes a self-discovered nobility of soul rather than royal blood or religious transmission. This amalgamated Religion of the World, or Religion of Love (as it was sometimes called) made a lot of space for idealism, self-sacrifice, and a radical reframing of personal values. The motive to embrace a mission of healing, teaching, and personal mysticism became the rallying cry of these new magical practitioners. The Church had unwittingly added motivation to the new archetype as well. It is part of the bedrock belief for all Christians that the gift of the Paraclete (Holy Spirit) at Pentecost certified that virtually every human born thereafter has the right to claim to be a direct descendant of Christ's Holy Father. This makes every human soul a potential immortal in the making, and self-election for entering the magical, theurgical path involves recognizing oneself as such and living that truth. These ideas were not new by any means -- many other religions have offered pathways towards apotheosis for those few who could bear up under the austerities and rigorous testing that are part and parcel of initiation in all traditions. But Christianity had lowered the bar to entry considerably -- one had merely to 'believe on Jesus Christ' and soul survival was assured. This democratized the magical mission to a degree that had never been seen before. Increasing education levels in the great cities of Europe allowed for more and more people to have access to literacy, literature, and the magical Word. By piecing together the historical lore of magi, holy men and charismatic healers accumulated from all the cultures of the known world, a composite portrait emerged that provided scaffolding for the new image of human potential. There were plenty of inherited raw materials at hand to work with -- from the doctrine of Adam Kadmon to Zodiacal Man, the Hermetic Cosmos to the Cabbala Tree, the Hebrew alphabet to Hermes' Caduceus. Applying these various cosmo-biological modes to their own experience, their own realities, the magical thinkers of the 12-1600's turned their shamanic and priestly attentions inwards, towards their own growth and enlightenment, not waiting for the masses or even their priests to support them. Increased attention on the relative dignity and power of agency of the individual are a part of the hallmark of the Renaissance. 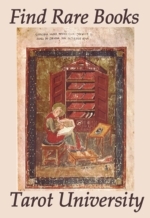 The influx of ancient and 'foreign' literature from the growth of the Moslem Universities into Europe, as well as the occasional exchange of manuscripts between Catholicism and Orthodoxy, created a context within which the individual could identify him or herself in ways previously closed to the average westerner. 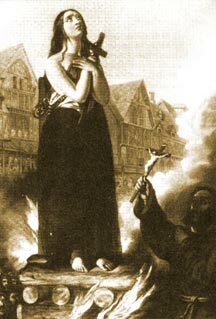 Passion grew in the mystical heart of Europe to have a spiritual calling and embark upon a Quest, to at least have a personal experience of the Divine rather than just professing faith and harboring doubts. As standards of living gradually improved and a merchant class emerged, more people had the wherewithal to undertake journeys just for pleasure and/or study, leading to further cross-pollination. Even those who were homebound benefited, as the numbers of educated people per generation steadily increased, seeding the landscape with people who could read and write and engage with a larger world than simply the local village, castle, and woods. Meanwhile the Church developed into a state of such decadence that it tended to function more like a mafia or a rogue nation than as a haven of refuge for the people. Its overweening ambition on political fronts kept fanning cultural schisms, and the individual priests were as often parasitical on their flocks as they were nurturing. Further, the Church had claimed for itself the power to heal its members of illness, a claim that it could in no way live up to. Periods of plague and pestilence ground home this point with increasing regularity, leaving the average family vulnerable in the face of unchecked disease, injuries, birth mishaps, conditions of aging and malnutrition, and other common challenges. Whereas hereditary kings and shamans had previously served the people for priests, healers and leaders in times of need, those traditional channels had been closed and snuffed out, leaving a largely charisma-free and poorly educated clergy to stand in their place. In some places and times, the Church was so hostile to indigenous healers (surgeons, dentists, herbalists, midwives and the like) that the norm was persecution and accusations of witchcraft (in the case of successful cures), or in the worse case, mob murder. For these and other reasons, the impulse grew in the increasingly educated European mind that a properly prepared individual of sound mind and body could, at special times and in protected contexts, bypass the intervention of clergy in the search for cures and solutions to life's physical and metaphysical ills. An ennobled individual could and should serve as an intermediary between ordinary humans and the greater Powers that rule over our world, creating the circumstances we experience day to day. In the face of the dismal success rate of established methods, what was the logic of suppressing the nobler impulses of the God-inspired layman anyway? It gradually became evident to the deepest thinkers that the work of priestcraft ought not to be left to the priests anymore, or at least not exclusively. While this ethos of self-election to spiritual cultivation and Quest was growing in the western psyche, another impulse was also ripening like a twin in the same womb. What I'm referring to here is the vine, blossom and fruit of the Image Magic revolution that welled up and spilled over all Europe commensurate with the Cathedral-building era. Our of the historical records and down from the walls of the illustrated and carved churches and cathedrals came the images of the ancient gods, angels, Virtues, Muses, Arts & Sciences, Planets and Signs, appearing with greater and greater boldness every century. No longer frozen in place, carved in stone or embedded in frescoes in the House of God, these images start to show up on public squares, in private gardens and manuscript illustrations. The printer's art pushed the envelope exponentially, facilitating these images' migrations from the monumental scale to the pocket postcard. The cast of magical characters and the techniques of theurgy were undergoing a democratization, escaping the grasp of the hierarchical, vertical axis of Church and King, to gain horizontal ground in the self-actualized imaginations of the educated visionaries. Even as magic was becoming more remote from its traditional mooring in priestcraft, exorcism, royalty and charismatic healing, it was becoming more accessible to the individual, and more attractive as a method for self-development. The magical practitioner was never alone in his or her solitary experiments. We must also note the relentless fleshing out of the intercultural catalogue of names, entities, symbols, substances and correspondences as this trend develops into the full blossoming of Renaissance magic. The more ambitious magi stopped relying on the simpler and more earthy practices from pagan times -- practitioners were now constructing a 'science of the Spirits', a thoroughgoing correlation of everything that had been left to them through history. To some degree this proliferation of referents was meant to magnify the contact between the operator and the summoned energy during operations. The multiplication of tangible correspondences provided a wide range of receptive materials to ground the magician's connection and substantiate the apparition's appearance. But there's an undeniable element of sensual-gratification and ego-fulfillment here from the aesthetic side as well -- as magical studies and theurgical arts become more popular with the upper classes, the operations tend to proliferate in complexity, demanding more pomp and paraphernalia, more artistry, more education and expense to fulfill. A side-effect of this trend is that the more the creative substance and spiritual zeal were stirred, the more the practitioner's experience is intensified and his or her commitment deepened. This newly evolving private religion was known to embrace Beauty (in the forms of magical art, fabrics, gems, and ritual tools), music, wine, psychedelics, sensuality, dancing, Nature, and the cultivation of spiritual 'frenzy' of various kinds. As previously mentioned, this trend towards self-denominated theurgists taking up where the Church was leaving off was psychologically and mystically driven home through a freeing of the magical image, away from it's previous scholastic and religious context and towards a more personal mode of interpretation. As mystical Christians began to learn Arabic and Hebrew alongside their Greek and Latin, a rich mix of inspirational ideas and cross-references became available to them to draw from. The numbers of arithmetic and the letters of the alphabet accumulate gravitas as this education commences. Comparative study in the ancient myths, the Old and New Testaments, and the works of the Greek philosophers demonstrated that certain universal Ideas were to be found everywhere, East and West, in every century, though in different garbs for different cultures. A great 'Eureka!' began to ring across the generations, a collective "AHA!"' that moved from culture-center to culture-center as comprehension of the essential issues spread. Without trying to say there is one universal, immutable, indissoluble Truth that I, CPT, am empowered to impart to you in this essay, it remains my goal to demonstrate how these "AHA!" experiences might accumulate in the consciousness of a diligent mage. Consider placing yourself in the shoes of the type of Renaissance esotericist I frequently write about. Let us stake out a position and assume that your spiritual totem, the project you are working on at this time, is involved with the archetype or egregor of Mercury/Hermes, the patron deity of all the magical arts and sciences. You want to get to know more about this energy, this Ideal, so you can have a direct experience of it instead of just standing on the outside, looking in. Like a good scientist, you want to do an experiment, get your hands dirty, and find out what can be done to interact with the Mercurial spirit within the theater of your own body/mind. You already have a cultivated imagination that embraces mystical teachings in multiple modalities. You have exposed yourself to enough of the operative principles of astronomy to be able to cast a horoscope, or at least intelligently discourse with an astrologer about the proper timing for spiritual rituals given your own birthchart. You are attempting to balance your own internal elements so that you can strategically moderate your personality to be more psychically sensitive and receptive. You have altered your diet and daily routines so as to be more available to commune with subtle forces around you. You have made a collection of energetic tools such as angelic images, stones, engraved gems and/or metallic plates bearing the names, numbers and sigils of Mercury, from Whom you are going to petition an efflux of inspiration, awakening, and knowledge. You have created a safe and sacred place in which to conduct your experiments. You might even be ingesting or burning a blend of herbs and spices that assists you in arriving at the wavelength of consciousness best suited for the intended spiritual encounter. At this point, what does one do with oneself? What is the content for this entire context? If the goal is to come into fullest consciousness of Mercury, what are the most often-cited and reliable signposts the magus will be course correcting to in the course of an experiment, meditation or ritual? 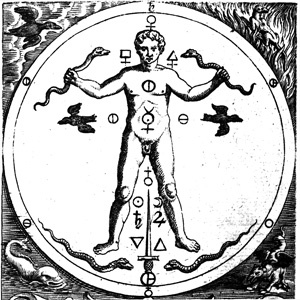 For purposes of this article, I have selected out the glyph of Mercury and the Wand of Hermes (also called the Hermetic Caduceus) as a point of focus because this polymorphous glyph is as nearly universal a magical symbol as any in the West, and because it has a connection to nearly every discipline of Renaissance occultism. Starting from this point, let's see how many disciplines we can find that add meaning to or take meaning from this universal sigil. Traditionally the astrological planets were paired up to represent classic polarities that interact to express the vibrancy and fertility of our solar system. The Sun and Moon are seen as the Lights of day and night. Venus and Mars embody the classic gender pair, the forces of attraction and assertion whose dance we echo in our cultural male/female relations. Jupiter and Saturn represent the pair that governs our opportunities and our responsibilities, our freedoms and our bindings. This leaves Mercury out of the pairing process, because this planet is seen, much like this metal, to be of intermediate form and energy. Shape-shifty and indeterminate, the polarity of Mercury depends upon what company it's keeping at the moment, and what aspects it's receiving from the others. Even its glyph is "hermaphroditic" (a blend of Hermes and Aphrodite), containing the symbol for Venus within it. Therefore the planet Mercury became the alchemical symbol for the state of androgyny, or as we might describe it in present time, whole-brain functioning. Anyone familiar with Trump #1 of the Tarot will recognize elements of that energy in this early description of Mercury. 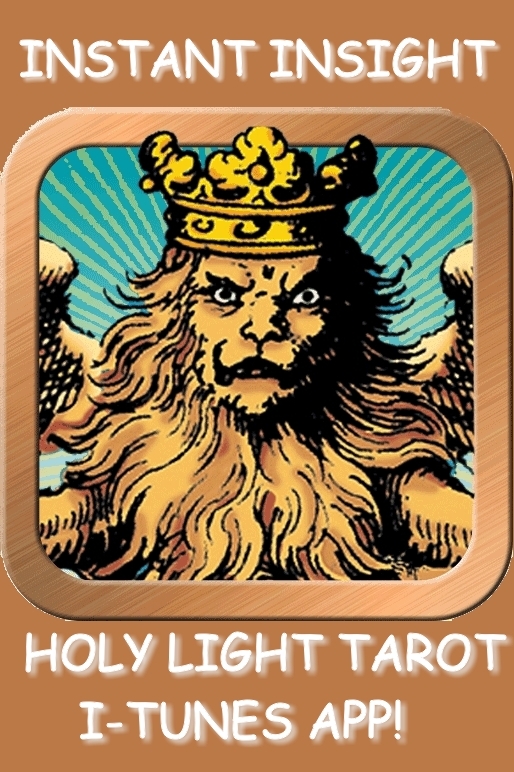 From the wandering performer and diviner, to the association with education, letters and numbers, this godform and planet could be taken as the patron deity of the Tarot.
" Two of [Hermes' essential] traits stand out from the tangled undergrowth: first, his guiding function, linked to his extreme mobility; second, his mastery of speech and interpretation, warrant of a certain type of knowledge... His route is not the shortest distance between two points: it is a world in itself, made of serpentine paths where chance and the unforeseen might happen. Hermaion means 'fallen fruit' or 'wind-fall'. To profit from windfalls does not exclude the possibility of giving destiny a slight nudge, through tricks and subterfuges. Thus one sometimes finds Hermes unearthing hidden treasures; and it is only a short step from there to making off with them! ... In the same spirit, eclecticism is justified -- and plagiarism too; but 'stealing' is not a good rendering of the Greek kleptein, which suggests rather the idea of a ruse, in the sense of a 'secret action'... And is not hermeneutics all about bringing hidden treasures to light? When he entered European consciousness, Mercury was the god of the planet by that name. But even in his planetary persona his shape shifting is ceaseless. For one thing, Greek society in Alexandrian Egypt had made the conflation of Hermes/Mercury to Thoth, figuring that the Egyptian god of writing and letters was an earlier form of the same deity. Hermes was in Egypt credited with the authorship of a great number of books under the general title of Hermetica. Very few of the named works so attributed have ever been found, but the rumor was itself enough to cement Hermes/Thoth's reputation as the source and master of all learning that could be conveyed to humans. Meanwhile, a distinct trend in early Christianity occupied itself with rationalizing away the pagan Gods as glorifications of human beings whose deeds and skills were so impressive that they came down through history as "godlike". Thus Hermes became historicized as a person, and was even given multiple incarnations to demonstrate the immortality of this exalted being. It is through this understanding that we get the image of Thrice-Greatest (thrice-born) Hermes Trismegistis. Add to this list of personas the Arabic Idris, the gnostic Shepherd of Hermas, the alchemical Mercury, and the five different personages defined by Boccaccio; The Planet, the Physician, the Orator, the Trader, and the Thief. This is not to mention the many variant portrayals of Hermes/Mercury found in art and literature. 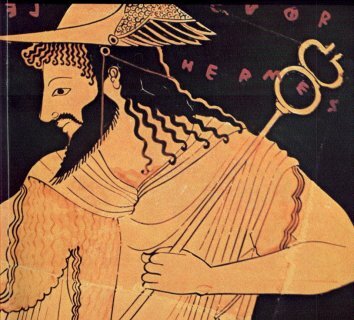 A literalist would have to say that there have been multiple Hermes' moving through the collective consciousness both serially and simultaneously, though of course each version is a spark struck from the same egregor or internal Image. All of these facets of Mercury were available to the Renaissance magus, allowing for a kaleidoscope of qualities and attributes to draw from and emulate. "... as a 'soul' [psyche], possessing a bond of sympathy with the mysteries of Heaven; he is sent by god into our lower world in order to teach true knowledge. 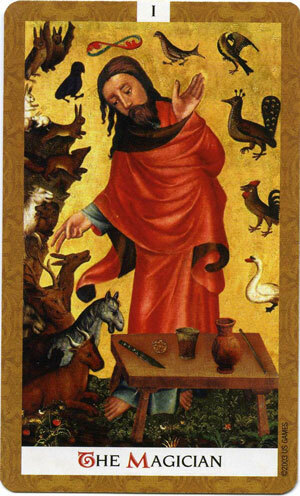 The Lord commands Hermes to participate in the creation of mankind as steward and administrator. Thus one can see him as the principal actor, after the supreme deity, in the anthropotonic drama. He is a soul that has descended here as the first divine emanation, preceding the second emanation represented by Isis and Osiris, who are also sent to this lower world for the instruction of humanity." (op. cit. p. 16). Observant readers will hear in this description a remarkable resemblance to the Hebrew Shekhina, the Christian Logos and the Gnostic Christ/Sophia, which should remind us again of the fundamentally hermaphroditic nature of Mercury in every manifestation. This is the quality that is highlighted by his totem symbol, the Caduceus, which stands in for Mercury as both sigil and sign. There is so much to say here that it's hard to know where to start! We must remember that the Christian exploration of the Hebrew mysteries started slow in the early centuries of the Christian era, but gained momentum and popularity after the Crusades. By the time of the Renaissance, full-blown contact with Holy Land culture and teachers was available to those who were committed enough to collect books and travel to the areas around the Mediterranean where centers of Hebrew and Arabic learning were established. 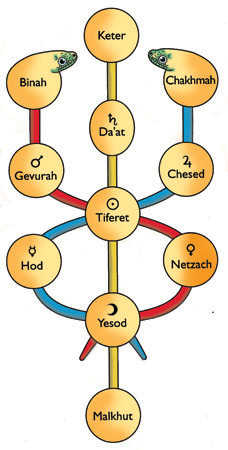 In a previous essay, Confluence of the Three Great Systems, (PDF), I have made the connection between the Wheel of the Zodiac, the Caduceus and the Hebrew Tree (which is itself an abstraction of the human body with the Planets and Signs overlaid). This makes it easy to see how each symbol illuminates and amplifies the others. None of the ideas combined in these ways were new to the Renaissance Magi. The Sefir Yetzirah, primary astrological textbook of late Antiquity, explained The Signs and Planets of Astrology upon the Tree. The image of the 'melothesic man' (the human body linked to the various signs of the Zodiac) had been introduced in Europe via Arabic astrology in the 12th century. As this synthesis of Greek, Arabic, and Hebrew esotericism spread across Christendom, it provided the West with it's own version of the Hindu Chakra Tree, a diagram of the occult physiognomy of humanity. Therefore we can rightfully point to the Caduceus, Mercury's symbol, as a concentrated teaching on the ultimate meaning of human intelligence and physical embodiment, which captures in the microcosmos of the individual the full divine scope and powers of the Creation. The Caduceus, like the Tree, is quite simply another layer of the map or x-ray that explains the way humanity is, indeed, 'created in the image of God'. 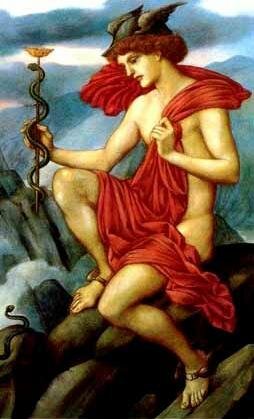 MERCURY As a symbol in its own right, the caduceus has a pedigree as long as that of its carrier. As mentioned earlier, the astrological explanation for the shape oF Mercury's symbol is a stack-up of the cross of Earth or matter (hyle), a solar orb, and a lunar crescent, hence a linking or bridge between the Three Worlds (earthly, astral and Heavenly). Looking at the art of astrology instead of its script, meanwhile, we see the godform of the planet Mercury carrying a winged staff with twining serpents. It does not take much effort to visualize how the astrological glyph for Mercury is a simplified restatement of the staff in Mercury's hand. Now let's add in the information that's been so condensed in the glyph that it doesn't convey consciously unless we have educated ourselves to know what's there. There's another hidden symbol in the Mercury Wand, and that's the ouroboros in the form of a lemniscate. Wonder what I'm talking about? Here's a quote from Julius Evola's The Hermetic Tradition; Symbols & Teachings of the Royal Art, taken from the first paragraphs of the chapter called " 'One The All', and the Dragon Ouroboros". At this point he is suggesting that what this symbol refers to is not an abstraction or a concept that can be intellectually grasped, but an actual multidimensional experience in consciousness.
" ...Certainly it is not a question, in this case, of a philosophical theory -- a hypothesis reducing everything to a single principle -- but of an actual state brought about by a certain suppression of the law of opposition between I and not-I and between 'inside' and 'outside' (subjective/objective). These dualities, with rare exceptions, dominate the common and most recent perception of reality. The experience of this state is the secret of what the literature calls the 'Materia of the Work' or 'First Matter of the Wise'. Only from this state is it possible to 'extract' and 'shape,' by 'ritual' and 'art' ... everything that the tradition promises, in spiritual as well as operative (i.e., 'magical') terms. "... The closed line... the circle of Ouroboros, also has another meaning: it alludes to the principle of exclusion or 'hermetic' sealing that metaphysically expresses the idea of a unilaterally conceived transcendence being extraneous to this tradition. Here the transcendence is conceived as a mode of being contained in the 'one thing,' which has a 'double sign': it is both itself and the overcoming of itself; it is identity and at the same time poison, that is to say, it has the capacity to alter and dissolve; it is both dominating (male) principle and dominated (female) principle... and hence androgynous." Note the emphasis on the consciousness-liberating event, brought about by resolving the tension of yoked opposites through accomplishing their fusion at the centerline. This one concept is itself a great Arcanum. And the caduceus always illustrates at least one double helix -- the intertwined energies make two full exchanges around the rod. How did they know, we wonder? The Ouroboros has yet another manifestation, with both literal and metaphorical implications. Astrology deals with circles, but due to the eccentricities of the planetary orbits, those circles are never perfect, symmetrical and tidy. In particular, the Moon's orbit includes wide fluctuations above and below the equator, which is what creates her changing appearance through the cycle. Superimposed against the straight line described by the plane of the ecliptic, the Moon's motion describes a serpentine path, with a great swing to the north and a great swing to the south every month. (The North and South Nodes are the places where the Moon crosses the midline.) Connect the ends to adjust the image from a linear to a circular view, and you have the lemniscate -- the sideways figure-8 one routinely sees in the hats of the Magus and Strength cards. Now re-impose the central axis and you have a Caduceus again! In true shape-shifty mode, the lemniscate and the caduceus are in constant motion around the central axis and the crossing-point of the arcs, repeatedly opening and closing in the process of receiving, drawing down, refining, and then re-elevating the energies of soul through the adventures of matter. These variations on the theme point up a subtle distinction: In the astrological symbol, Mercury's head is crowned with the two horns of a crescent moon rather than another full circle. The head biting the tail of the Orouboros Serpent is not visible in the Mercury glyph, having disappeared into the world 'above'. We see this in the caduceus as well -- the twining serpents will cross at least twice, but the symbol remains open at the top, other than the rod itself piercing up and out. The distinction between one figure and the other is resolved in the Viridarium chymicum figuris by Daniel Stolcius de Stolcenberg (1624). 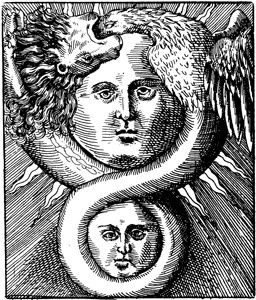 Here we see the very moment when opposing forces touch; the rising side of the lemniscate has a lion's head and the descending side has an eagle's head, with the serpentine body encircling the faces of the Sun and the Moon. At the apex of the image, the lion's head yawns open to swallow the eagle's head, thus closing the coil, moving the implication from the polarity of either/or (division by time and space) to the resolution of and/and (One the All, eternity). "Dee's monad represents the Alchemic process and simultaneously the genius and evolution of the cosmos. This is the Work which the magus, partaking of the divine, furthers: the redemption and transmutation of the worlds. To 'raise', as Dee has it, 'the element of Earth through Water into the Fire.' Whether, in the Jacob's ladder reaching from heaven to earth, the planes of manifestation are envisaged as ten, as in the Tree of Life; as four: 'natura, horizon temporis, horizon aeternitas, horizon mundi supersupremi', as in Johannes Pistorius, Dee's contemporary; or simply as three: terrestrial, celestial, and super-celestial (Agrippa, et al. ); it is in all cases cabbalistic truth that the same forces operate and the same forms manifest on each separate plane (level) (sephirah). 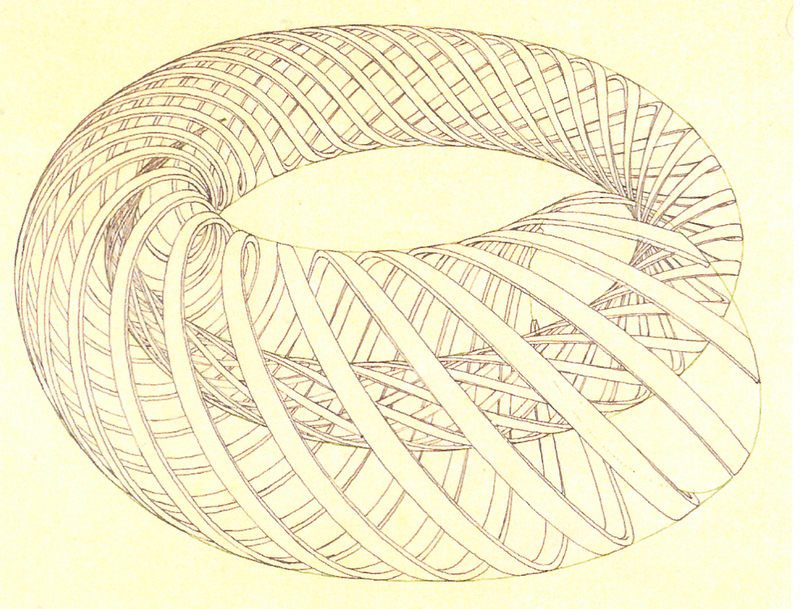 Mathematics is uniquely the clearest and most flexible expression of the relations between these forces and forms. The monad is Dee's expression of these relations: it is diagram, at once, of process and goal. From the point in the center of the circle, the entire glyph unfolds, theorem by theorem; yet it was always there; it was produced instantaneously; and we feel that its shape is inevitable..."
From Dee's work forward, there is an unmistakable acceleration of alchemical symbolism spilling onto the public eye, much of it covertly if not overtly indebted to Dee's alchemistic inspiration upon the Mercury symbol. Jacob Boehme, (a German protestant mystic whose visionary explications of the inner workings of Creation drew from Paracelsian alchemical ideas, Hermetic imagery and -- some say -- Hebrew Kabbalah), integrated the monad into his work and used it as an explanatory key to his own account of Creation. We see occasional appearances of the monad in subsequent alchemical works, and the Rosicrucian movement was also undoubtedly enriched by the mode of thinking and expression that Dee introduced. Somehow, during the 13-day brainstorm that birthed the monas, Dee captured for the collective hermeneutical imagination another interdisciplinary, between-the-worlds cipher with which to record the distinctive stages of interior transformation through the subtle properties of matter. There is no doubt about it; the alchemists occupied a privileged historical position, in that they inherited a magical mountain of enriched symbols, literature and mystical vocabulary with which to quantify the results of their investigations. By the mid-1600's, the heyday of the alchemical movement in Europe, the synthesis of disciplines and convergence of imagery is complete, giving birth to such a superabundance of creative visioning that it took until the 20th century psychedelic revolution to equal alchemical art in intensity. Letters from different sacred scripts as well as astrological and elemental signs were deconstructed and reassembled along the lines that Dee mapped out, eventuating a new set of magical hieroglyphs. All the emblematic arts (heraldry, manuscript illustration, the frescos and carvings decorating the churches, Ars Notoria and Art of Memory forms, Tarot cards and related image catalogues) were raided and their subjects liberated from their historically dictated frozen poses to flesh out, cartoon-style, the unfolding stages of the Great Work. This wonderful multidimensional conversation fairly leaps off the page, presenting us with some of the densest, obscure and fascinating imagery of the whole magical catalogue. 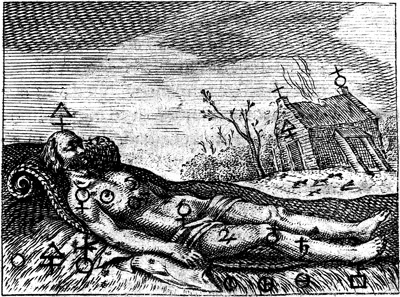 From the point of view of our overview of the Mercury/Caduceus, one of the most interesting of the later alchemists is Goosen van Vreeswijk, who published in 1674-5. His images are studded with astrological/elemental glyphs and a range of alchemical sigils that are obviously the results of following the trend that Dee anchored with his Mercurial Monas. Here we can see how truly expressive and meaningful these synthetic alchemical glyphs, somewhere between letters, numbers, and signs, can be. As we make this admittedly superficial tour through the dense and loaded body of correspondences that constellate around Mercury and the Caduceus, let us note that it takes thousands of words to say what these images convey suggestively in a glance. These explanations are but the tip of the iceberg compared to what is truly there to be seen, but only long study and a flexible habit of mind will penetrate this forest of associations and actually contact the living essence of the Mercury force. It is that very liquidity and inclusiveness of mind that is Mercury's signature, so much so that 'he' cannot even be typecast relative to gender or yin/yang functionality. Mercury's reputation for bringing hidden things to light, awakening the soul from obscurity and oblivion, promises that exposure to these various facets and significances could potentially have the power to illuminate unknown realms of the soul, liberating undefined numinous spaces that hide behind our defined and quantified "knowns". It should be clear at this point that the magus or practitioner, Mercury's Caduceus, Adam Kadmon (or Cosmic Man, expressed in emblems such as the Cabbala Tree and the Zodiac) and the Gnostic Pleroma are each metaphysical extensions of the same thing at different levels of being. Each manifests a different order of magnitude within the Mystery of Incarnation, co-existing simultaneously in and as fractals of each other. The ever-changing microcosm of individuated humanity, embedded in elemental Nature, reveals the materialized reflection of every possible interior variation of the collective Psyche (the soul-life of humanity). This force of psyche, also known as Sophia, is Herself eternally shaped and led by irresistible influx from the Inscrutable Father raining down from solar system, stellar, and galactic levels. This is the Mystery of Incarnation. We are all embedded into and nested around each other, and that is the method by which the great Mystery gives every life form its own realm within which to exist. As all these micro-, meso-, and macrocosmic influences interact in and through us, the alert and attentive human can begin to observe the links and connections by which the Sophianic soul-force and the Heavenly Father radiations penetrate into us and affect our unique, immediate experience. Those with magian proclivities can begin the experiments necessary to sensitize and focus their individual energy-bodies to more accurately register these larger contexts and conversations. Our Gnostic, Kabalistic, Hermetic, Astrological, and Theurgical ancestors have left us a rich 'trail of crumbs' via a generous stream of inspired writings, images, emblems, symbols and glyphs that light our way along our studies. And then there's the living presence of Nature, the Soul of the World, Who reaches out to us from every direction day and night. Truly, there is no lack of channels by which these realizations might reach us, if we but put ourselves within range of perceiving. This is not an article that purports to teach the exact how-tos of magic, or to encourage anybody who doesn't have the calling to embark upon this path. But to the student of these arts, it will contain more than enough inspiration to provide a spur for future experiments. One has only to 'step into' and 'try on' these variant forms of the Mercury glyph to discover the attractions and challenges of multidimensional consciousness. Investigation into different uses of the Cabbala Tree (such as can be found in Qabalah; The Mystical Heritage of the Children of Abraham by Feldman), the inner dynamics of the I Ching hexagrams, the earliest Druidic Runes, and/or the full set of astrological and elemental glyphs can also give remarkable results along these same lines. How does that line from the movie go? "If you build it, they will come."